Business unionism is out, social movement unionism is in: On this, North American union activists agree. They’re confident that, after decades of givebacks and setbacks, labor can finally turn itself around if it starts thinking more like an expansive movement and less like an agglomeration of hidebound institutions. But while skepticism regarding the actual practice of social movement unionism is warranted, complete dismissal is not. Debates around labor revitalization strategies use this concept as shorthand for the best we might aspire to: a unionism that is militant, internally democratic, committed to social justice, attuned to class, and part of larger social and political mobilizations. The trick is to sort out the genuine commitments from the smoke and mirrors. Proponents of social movement unionism have found inspiration in the explosion of mass industrial unionism during the Great Depression. It’s not hard to see why. With the morale and dynamism of unions at historic lows today, it seems reasonable to revisit what went right for workers in a period even more challenging than the contemporary landscape. For labor activist and writer Jane McAlevey, the Communist-led “deep organizing” of the 1930s was especially significant. This strategy was rooted in the capacities of rank-and-file workers to act as organizers in both their workplaces and their communities. Workers sat down in their workplaces, prevented banks from evicting people who were behind on their mortgages, and marched with the unemployed. In Minneapolis and San Francisco, community solidarity with teamsters and longshoremen helped shut down the city. Against the exclusivity of craft unionism, deep organizing favored working-class organizations that crossed boundaries of skill, race, and gender. Above all, this approach grasped the importance of building a cadre of committed organizers who could give confidence to the rank and file and assist in developing its organizational and political wherewithal. Workers and practitioners didn’t label their organizing strategy “social movement unionism.” They simply took it for granted that the workplace and the community overlapped and that employers’ ferocious resistance to the new unionism made worker-community alliances a necessity. Precarity didn’t describe just the plight of a specific group of workers, but the circumstances (with certain exceptions) of the working class as a whole. In this context, it was superfluous to add the qualifier “social movement” to the word “unionism.” Union organization was the period’s paradigmatic social movement, as it would be for decades to come. Another source of inspiration for what is now known as social movement unionism were the struggles in Global South countries during the 1970s and 1980s. In South Africa, Brazil, South Korea, and the Philippines, unions were at the forefront of the fight to win basic liberal-democratic freedoms and union rights. These mass workers’ struggles — whose aims extended to defeating capitalism itself — may seem miles away from the organizing in the developed capitalist countries today. But the Global South militants’ success in democratizing their societies and legitimizing unions lent an aura of credibility to their organizing framework, particularly as it concerned membership participation and the development of a mass community base for unions. It was out of these struggles that the concept of social movement unionism was in fact born (though in some cases a more accurate moniker, given the revolutionary currents within them, might have been socialist movement unionism). A third inspiration — emerging out of the failures of traditional unionism in the face of new, more aggressive attacks on social programs and the labor movement — is more recent and homegrown. Its exemplar is the Chicago Teachers Union (CTU). Buoyed by new leadership — which won power in 2010 and included socialists from a variety of political traditions — CTU members fully grasped that the battles they waged couldn’t be confined to collective bargaining, electoral activity, and lobbying. Addressing the Chicago public school system’s seemingly intractable problems depended above all on education workers and parents of students confronting systemic racism and class inequality. Crucially, the militants who took over the CTU didn’t forget the essential precondition for successful community outreach: building and consolidating a solid base among their own members. It’s not surprising that social movement unionism has gained near-universal credence in the North American labor movement. Because there are concrete examples, it seems reachable in a way that socialism — which remains an abstract and overwhelming ideal to many — is not. Moreover, given the exceedingly precarious position of organized labor, moving toward social movement unionism might seem like common sense to union members and leaders alike. Yet, in contrast to the sit-down strikes of the 1930s and the mass protests of the 1960s — and in spite of the brutality of neoliberal capitalism — social movement unionism remains localized, partial, and sporadic. While there are pockets of hope, as exemplified by the CTU, there has been no mass explosion of substantive social movement unionism in North America. Why not? Clues, if not answers, to this apparent paradox can be found in the very successes of unions, which dramatically altered both the contexts in which they operated and their internal organizational dynamics. As the industrial unionism of the 1930s attained organizational self-sufficiency and institutionalization through collective bargaining, the need for strong and organic community links faded. This was especially true in the 1960s. The militancy of that decade led to initial gains for specific subsectors of workers, most notably in the public sector. The apparent consolidation of these gains, however, isolated these workers from the rest of the working class at the very moment capital was launching its neoliberal counteroffensive. The focus on “contract unionism” left unions fighting on narrow terrain, armed with strategies that were no match for the broader economic changes under way. In countries formerly ruled by authoritarian regimes, winning liberal-democratic rights also altered the nature of the movements. The legacies of earlier struggles did not disappear, but the relatively clear-cut enemies of the past gave way to more ambiguous realities: the competitive pressures of globalization, the restructuring of the economy and fragmentation of the working class, geographic mobility and the breakdown of historic communities, the seductions of consumerism. The changing environment has driven wedges between formerly close allies. In Brazil, unions that fought the military regime as part of the larger struggle for socialism have seen their base integrated into capitalism and a “workers’ government” that imposes neoliberalism and austerity. In South Africa, labor joined forces with the African National Congress and the South African Communist Party to bring down apartheid, but now finds itself with two parties that have accommodated themselves to neoliberalism. As for the CTU, despite its impressive response to the exhaustion of contemporary trade unionism, it continues to confront the limitations of “social movement unionism in one union.” During their 2012 strike, Chicago teachers received very uneven support from the rest of the city’s labor movement; the CTU remains a minority within the American Federation of Teachers at the state level. Even with community support, the union failed to block the school closings that immediately followed their extraordinary victory. Today, teachers and education workers face budget cuts and pension threats that can only be adequately dealt with through struggles that go beyond Chicago — and even Illinois — to the larger structures of US capitalism. In progressive circles, social movement unionism is conceived of as the melding of two separate and fundamentally different formations: “social movements” and “unions.” This understanding tends to overstate the current capabilities of social movements, however. While the many shortcomings of unions are readily discussed on the Left, social movements are generally handled with kid gloves. Yet there are few (if any) mass social movements in North America, and their resource base pales in comparison to that which unions enjoy. Though movements raise the banner of participatory democracy, their institutional weaknesses often result in less-than-democratic internal procedures. Where they focus on particular identities or single issues, their political outlook is often just as narrow (sometimes even narrower) than those of unions. Their anticapitalist élan often entails radical protest tactics, but they rarely consider what it would actually take to confront the capitalist state and overcome the inertial power, resiliency, and resoluteness of the capitalist class. The chief obstacle to real social movement unionism is resistance within unions to the all-encompassing changes it would require. Social movement unionism is not about labor supplementing what it is already doing (for example, with better policy proposals or new departments) or establishing “external” alliances with other movements. Rather, it’s about sparking a revolution inside unions — above all, by infusing them with class politics. Such a transformation would entail overhauling virtually every facet of how unions function: how they relate to their members, other unions, and the community; how they allocate resources across departments and between locals and the center; the kinds of research they do; the role of staff and the content of staff training; their bargaining priorities; and the tactics and strategies they employ to win those priorities. For many, the “social” in social movement unionism distinguishes it from the “old” Marxist and socialist traditions that focused on class relations and class struggle. More promising, however, is the orientation of those still sympathetic to the Marxist tradition, such as Kim Moody and Marta Harnecker. A recognition that workers occupy a subordinate position within capitalism. An independent working-class perspective implies an anticapitalist politics, however vague. Respect for working people as potential agents of change. This stems from both the working class’s strategic location in the economy and the potential development of workers’ capacities to analyze, strategize, organize, and act as a class. A broad definition of “working class.” The working class encompasses all those people dependent on wages and salaries or social programs: unionized and nonunionized, employed and unemployed, including the disabled and chronically poor. An awareness that because class is expressed in all spheres of workers’ lives, building the class involves more than workplace resistance. Links to the community should not be viewed as pragmatic ties to “others” but as ties to fellow members of the class and as incorporating additional dimensions of workers’ lives. A commitment to internal equality. To speak of a coherent class is to insist on the underlying equality of its members and to struggle actively against racism, sexism, homophobia, and all other barriers to full internal equality. An insistence on the deepest democracy within working-class institutions. Fostering the broadest possible participation from members is fundamental to winning any lasting gains. Likewise, building structures that facilitate working-class democracy is central to challenging the notion that hierarchical and bureaucratized decision-making is the only way to organize complex societies. How might this look in practice? Public-sector workers would assume leadership in the struggle for high-quality, democratically administered social services. Meanwhile, workers in the private sector would fight for production and democratic planning that serve ecologically sustainable, peaceful ends. More specifically, autoworkers could push to rejigger their workplaces so they could make the goods needed to confront the ecological crisis. Steelworkers could fight for the renovation and expansion of public infrastructure. Construction workers could demand public housing and the green retrofitting of existing housing stock. For all unions, organizing low-wage service workers would involve building the class, not competing for members and their dues. Mutual suspicion would give way to cross-union cooperation, providing a foundation for expanded organizing at the local level and new forms of solidarity, like citywide or regional unions and workers’ assemblies. Laid-off union members wouldn’t drop off the radar screen but would become fixtures at union halls — forming the natural base for campaigns to organize the unemployed. Social movement unionism shouldn’t be conceptualized as a single variant or a set of boxes that need to be checked off. It is better understood as an orientation to unionism that varies across time and place, a dynamic reaction to the failures of existing unions that involves complex and profound changes in the very nature of trade unionism. The Marxist left has always viewed the organized working class as the critical (though not the only) agent of social change. While the Marxist tradition recognizes unions as a necessary vehicle for working-class self-defense, it has also stressed the limits of unions as revolutionary actors. The current crisis of unionism, however, raises something more disturbing. It suggests the possibility — increasingly apparent since the end of the rank-and-file rebellions of the 1960s and 1970s — that unions, by themselves, cannot fulfill this elementary defensive role. Still, pointing out labor’s shortcomings doesn’t exonerate social movements. Indeed, the problem with most proposals for social movement unionism is that they tend to underestimate the depth of unions’ internal problems and overestimate the strength of movements. Stitching actually existing unions and social movements together may yield some positive results, but such loose alliances are essentially pragmatic and temporary. The sum of their inadequate parts remains an inadequate whole. What is desperately needed is the support of an additional institution (or institutions) that explicitly addresses the question of state power. This isn’t just a call for another party. Instead of engaging exclusively in electoral activity, this institution would work to bring out the best in unions and movements alike, facilitating their coordination while building the broadest political capacities within the working class: analyzing, evaluating, strategizing, organizing. Such an institution — standing with feet inside and outside unions, possessing an explicitly socialist vision — is indispensable to making social movement unionism a generalized source of working-class power. Consider the experience of the CTU. A crucial element of its success, however overlooked, has been the concentrated presence of socialists within the union. They brought a broader analysis, strategic insights, and years of community contacts to the struggle. When victory seemed improbable, they played a crucial role in raising the confidence of their fellow workers. The limitations of the CTU also underscore the need for a new institution. Though activists are fighting to spread the CTU’s approach to unionism within the American Federation of Teachers and the Chicago labor movement, their success will depend on whether they can secure broader organized support from those with the time, resources, skills, and contacts to do what one union and its fringe of allies cannot. The CTU’s ability to maintain its momentum and membership morale increasingly depends on larger political battles that cannot be won without an organization (or organizations) specifically dedicated to such battles. The widespread interest in social movement unionism is obviously welcome, as is labor’s interest in developing closer connections to various social movements. The problem is, there’s little reason to expect that a substantive move in this direction will arise from the internal dynamics of unions as currently constituted. There are certainly exceptions, and they point to larger potentials. But what is so striking about these exceptions is just how exceptional they really are. The solution, it seems, is a socialist party — one defined not so much by its policies but its focus on class building and its commitment to counteracting unions’ propensity to advance or defend immediate gains for specific groups of workers. To make social movement unionism a reality, we need an organization that can strengthen working-class capacities and propose long-term strategies for winning and exercising power. While Marxists have traditionally assumed that a socialist party is the preeminent vehicle for overthrowing capitalism, today it appears that such a formation is no less important to developing the ability to win, sustain, and generalize major reforms within capitalism. If the spontaneous development of social movement unionism can only go so far, and the existence of a coherent left is key to its proliferation, then simply blaming unions for its absence misses the point. The real failure here lies in the absence of a left. A mass-based social movement unionism is impossible without a reconstructed class-based left and its institutionalization in a socialist party. This might seem fanciful considering the current level of social struggles and the weakness of the radical left. But by now, it should be clear that it is even more fanciful to think we can enact a social movement unionism worth the name without a new institution. This isn’t a matter of choice. It’s a necessity. As such, we can’t leave its emergence up to chance or assume that, if times get worse, it will magically appear. Building an institution that can take on our formidable adversaries can only come out of a collective determination to construct it. If creating such an organization isn’t immediately possible, then we need to begin the widest and deepest discussion about what we can do to make it feasible down the road. Two examples might help clarify the argument being made here. The campaign to raise the standards of precarious workers has put their plight on the agenda and boosted wages in a number of states and cities. But in the case of Walmart workers, where SEIU and the UFCW have played such a crucial supporting role, can we expect a new dawn for labor by replicating the kind of unionism that the Left has so sharply (and correctly) criticized? 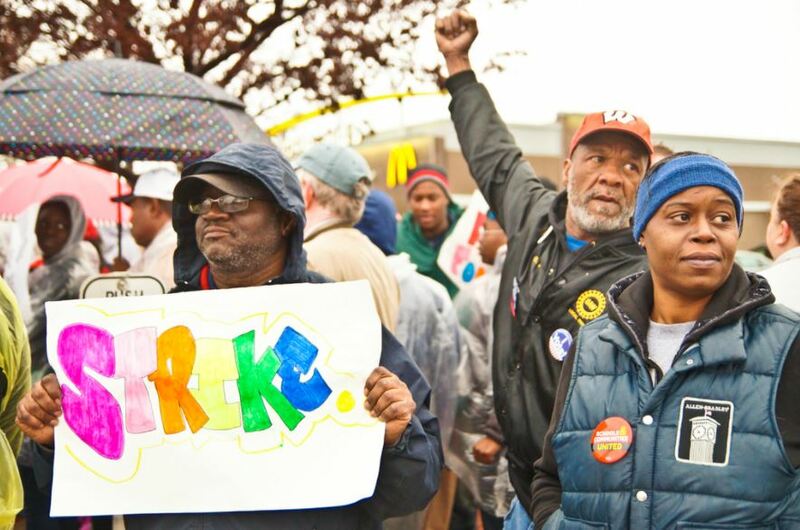 Furthermore, while the demand for a $15 minimum wage has gained impressive political traction, how does it build the capacity of workers to affect their working conditions, benefits, job security, and social programs? The Bernie Sanders campaign has also generated an enormous amount of excitement in the United States, but the big question is whether the energy and expectation surrounding it will endure after it’s over. Will his campaign encourage illusions about “next time” and reinforce people’s cynicism about electoral politics? Or will it, at long last, make it clear to millions that real movement toward radical change can only be accomplished when we go beyond the Democratic Party? Campaigns and struggles are ephemeral. The momentum they generate can only be sustained through an ongoing, organized commitment — institutionalized in a party — to developing the ability of working people to act as a collective force. Only then will social movement unionism become not simply an aspirational alternative to business unionism, but a radical force capable of bringing about transformative change.